I wanted to make a sticky covering the early Mark I action because of the high number of requests of how to improve sluggish action. 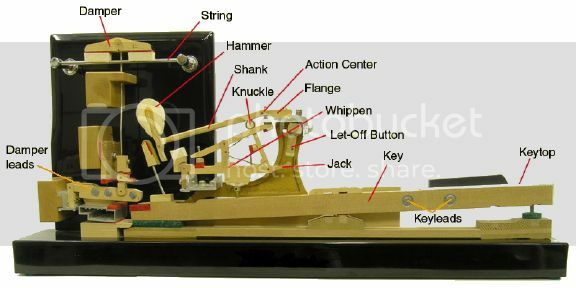 The fact is that the Rhodes action is extremely simplified compared to an acoustic piano action - the 2 major components are only the hammer, and where the hammer interacts with the key referred to as the key pedestal. This topic is about the improvements originally designed by the Rhodes engineers by use of a Pedestal Bump, a small piece of plastic added to each key, to improve the feel and lightness of the action. The basic concept is the lack of a "jack," or a fixed point where the key propels the hammer. An aftermarket recreation of this design is available as the "Miracle Mod" action kit from Vintage Vibe or others, and this guide covers installation and an explanation of why it works. There are other adjustments throughout the Rhodes that should be made for the most ideal action, however the Miracle Mod creates the greatest initial improvement for sluggish action for pre-1978 Rhodes pianos. The link below provided by Vintage Vibe shows their videos for installation on action beds. NOTE: Installation for 1976 - mid 1978 pianos is different and will be covered separately below. When comparing the hybrid wood-plastic hammers from 1970 - Sept. 1975, against the all plastic hammer from Sept. 1975 onward, the angles on the hammer cam are a very different shape all together from front to back. The old hybrid hammer is much more rounded in the back, while the plastic hammer from the factory bump era has almost 2 distinct flatter planes and gives a sharper fulcrum point. This plays into how to place the bump. The early Mark 1 hammer literally rolls over the pedestal: most of the energy is lost when the hammer is forced up because it's rocking horizontally over the ped. It lacks a "fixed point." A bump installed on the pedestal creates a "fixed point" throwing where the energy is concentrated at a small point as opposed to spread over the surface area of the pedestal. If you can imagine, a seesaw exchanges the energy most efficiently from end to end by having only 1 centered fulcrum - if a seesaw was mounted on a ball, it would take much more energy to rock it back and forth. The consolidation of energy on one fixed point helps to propel the hammer more efficiently without energy loss from unneeded lateral motion. Braking occurs when the back of the hammer lays flat on the pedestal, aimed at stopping the kinetic energy of the hammer from bouncing around after it's thrown. The pedestal bump effectively fills a gap at the rounded surface of the hammer, extending the length by which the hammer comes into stop contact with the key. This in turn reduces double striking, as the bump helps to catch the hammer from flopping around in the front after it's thrown. Every piano is different. The exact placement on pianos can vary from one Rhodes to another, all dependent on where the hammer curve interacts with the key pedestal. You can try to nail it on the first try, but I always recommend to test at least 3 keys of varying placements so you can feel the differences and see which location feels best to you. It may or may not be at the very front of the key pedestal. 3) See how high the hammer sits when you strike and hold a key - a hammer resting too high in the air is not good and can create escapement issues (hammer rests up against tine). If the bump is too far forward, you'll feel a resistance as the hammer curve "pops" over the bump, where the hammer is actually rubbing laterally against the bump. Once you get the right placement where there's no dragging feeling or popping, and there's no double-bouncing etc, take your model key and replicate placement on all the rest of the keys. A word of caution though - sometimes an action rail can be out of adjustment (or never adjusted properly from factory). So put the very lowest key and very highest key in, and make sure the hammer curve is in the same spot for both. If your lowest key has a curve that sits on the end of the pedestal, then your highest key has a curve that sits further back, then there's a slant from top to bottom in the action, and the bump will interact differently because it moves out of alignment with the hammers. Also as a note, the bump on hybrid wood-plastic hammer models is very touchy, as small differences in placement directly affects the angle interaction on the hammer and key. Remeber that this early action was never designed for a bump, so to get it right you have to find just the right spot. For testing the 3 positions on your keys, you may choose to use contact cement so the bumps can be removed after the test. Superglue should be used in the end for final installation of the bump and felts. Reason being, with a contact cement or other higher-volume glue substance, it can fill up the gaps where the felt covers over the bump, and create a sort of slope to the felt. The felt should be wrapped very tightly over the bump so that it can create the greatest affect. When the bump is secured with superglue, the felt should then be superglued with a decent amount of pressure applied directly to the area just before the bump. 2) remove the felts from the hammers, and install the pedestal bump with felts on top of the key pedestals. From what I can tell, the way the felts were installed at the factory on these models were to line up the felts with the BACK of the hammer cam. This means any variance in the length of the felts would vary at the hammer curve. Not good - this is the critical dimension. So all pianos over these years can be different - some would take the bump on key alone just fine, some with shorter felts would come into what I refer to as a "stop-lock" scenario where the bump collides with the felt in ideal placement - locking the hammer from moving. For the key below, placing the bump further back on the key to match the felt, results in the hammer resting very high and slams up against the tine in resting position - the note will thud and not ring. It takes a lot longer to install the modification incorrectly, remove it and then install it correctly a second time. For that reason, I really recommend doing bump and felt both on the keys. It provides for a smooth stroke with the bump UNDER the felt, and prevents any collisions. In my opinion, if you like a lighter and more efficient action it's necessary to have a bump mod. Through discussions with CBS Fender sources - the bump was originally designed and is present in most of the 1960s Silvertop pianos. It was removed during the early 70s as deemed either too difficult to manufacture or too difficult to calibrate. 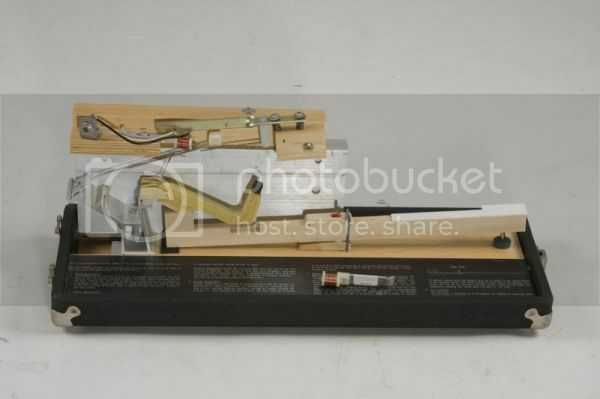 After many technicians in the field began modifying pianos with this method, it was later reintroduced on all pianos mid 1978-1984, including Mark 1,2,3,4 prototype, and Mark 5. That being said, of almost 20 years of Rhodes production the bump has been factory installed in one way or another for about 12 of those years. An original Mark V key pedestal with factory wood bump. Again as all pianos are different, certain pianos will need minor adjustments after the bump mod is installed. 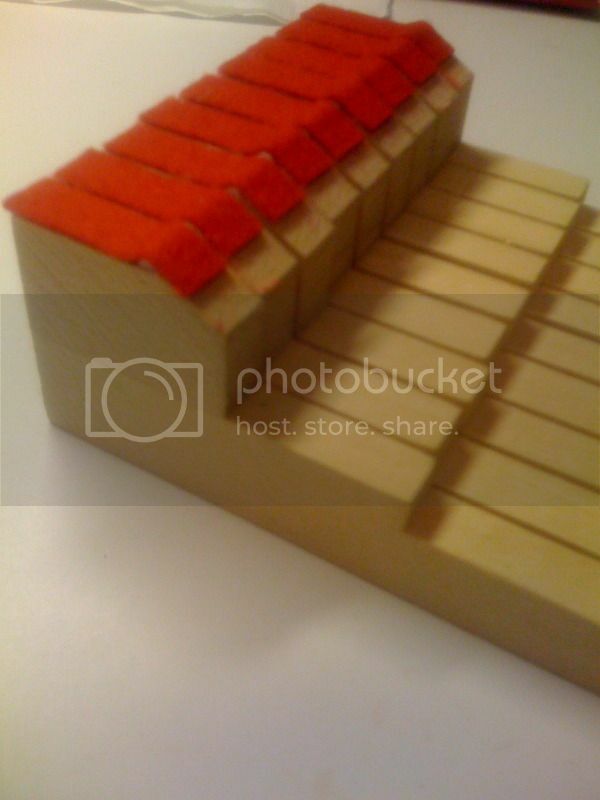 All the hammers should sit slightly higher than before which is normal. Depending on how installation goes, you may need to globally raise the harp slightly with a shim at the left, or left and right support blocks. I recommend all users to experiment raising the harp slightly to see if any double-striking or bark improves - quickest way is to throw a credit card under the harp on the left side. Should you need to raise the harp, you may also have to adjust the strikeline - the forward and backward location of the harp (search forum). 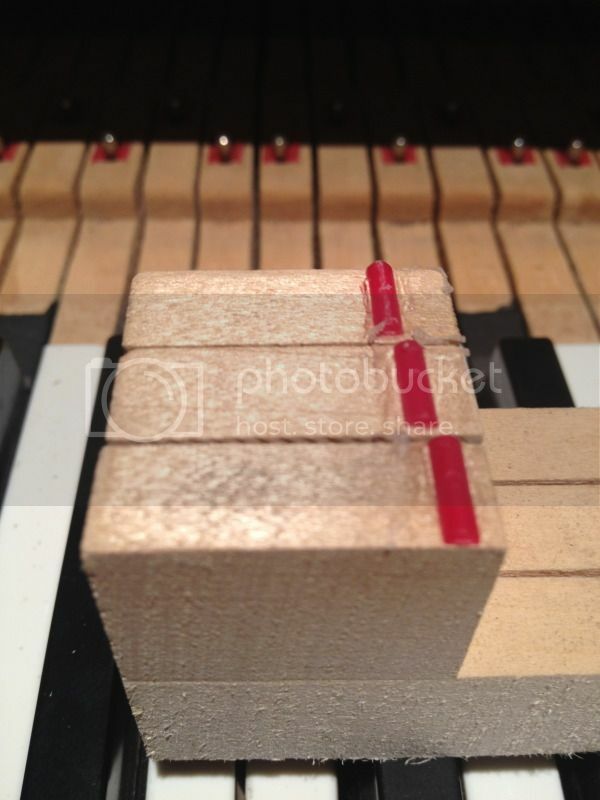 If a piano naturally has tight bridle straps, the bump modification can make your dampers incapable of stopping the tines. The bump mod slightly lifts the hammers into a higher resting position, which in turn pulls the damper straps a little bit. If they're very tight, it'll pull them away from the tine in resting position. The simplest solution is to bend the ends of the damper arm up. You want to make sure the bend is after the bridle strap point towards the end (if it were before, it would mess with how the bridle strap interacts). It's best performed with two hands - one holding the damper arm at the bridle strap point, and the other hand bending the end up. This also prevents a bend in the very back where the damper arm connects to the action rail. Too high of a bend up will result in hard-strike notes deadening out, as the tine collides with the damper felt. Not enough of a bend and the damper felts still won't be able to stop the tines. Also, double check how they all react with the sustain pedal when finished so that damper arms function properly with sustain. With your faster action, happy 32nd-noting! Fantastic post. Well done. This is a significant contribution. I'd like to second Rob's statement. This post would have been so helpful when I did the bump mod on my '77 piano...I left the felts on the hammers and after some slight alterations to the harp position, it works a treat and it made a huge improvement on the action. Indeed. I'm glad I have my piano torn apart right now so I can start rebumping it. Your post is extremely well thought out, informative and timely for me since I'm in the process of rebuilding a 1970 Suitcase. I am about to begin installing the Miracle Mod and I have a few questions. First, how do you get a clear view of the key and hammer from the side? Even with the keys out, the adjacent hammers seem to obstruct the view. Second, if the placement is as critical as you say it is and assuming that the new felt is uncompressed and therefore a bit thicker, how do you find the exact spot for the bump? If you place and mark it with the old felt in place it seems that the installation of the new felt would cause the hammer to lift a bit in the resting position. Since the new felt is supposed to be installed over the bump, finding the placement with the old felt removed doesn't seem like it would be accurate either. 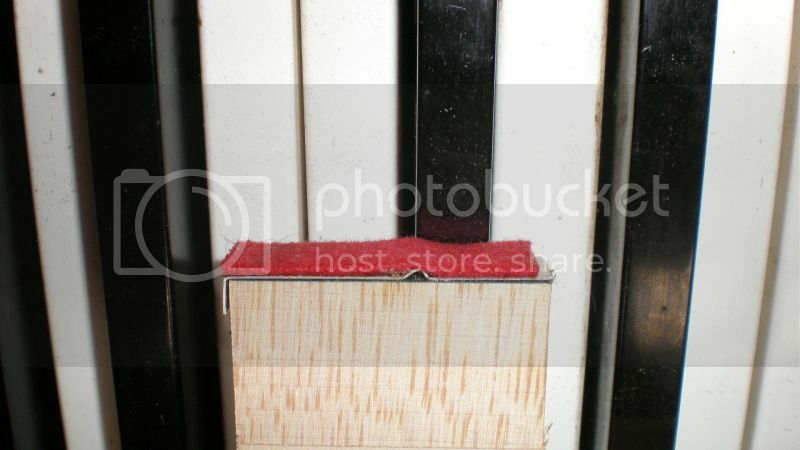 You can either hold the hammers up with your hand, rubberband them together and clip them up, or on some pianos with a little flex in the hammers you can actually push them between the tines and they can get held up there. I don't know if it's that critical, I was just saying that putting it more forward or more back can affect the hammer's final resting position. 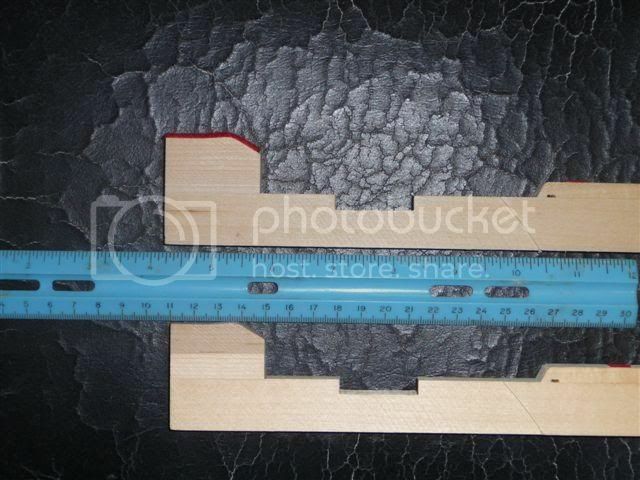 As long as you're in the area of a few mm of measurement it's ok. The new felts from Vintage Vibe aren't terribly thick, so it shouldn't play that big of a roll in comparison to the old felts. Best of luck! Definitely get one key set up and play with placement before doing all keys. My keys seem to either have a slight peak just before the slope down or the back of the pedestals are indented from continued use. I was wondering if this is normal and if it will affect the placement of the bump. 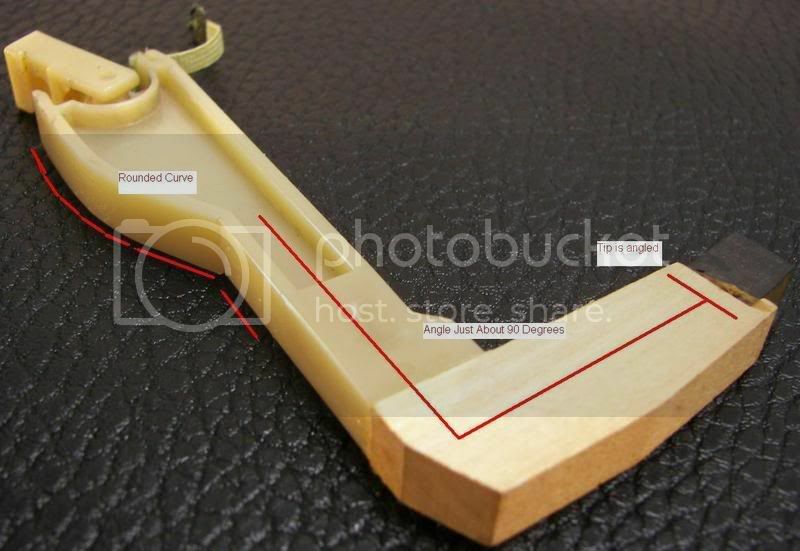 Also from further examination the hammers rest on the downward slope of the pedestal, not the flat surface so according to your theory I would need to install the bump on the slope which is contrary to the instructions on Vintage Vibe's video. The pedestal you're referring to around '70-'71 is termed as the Marcel Curve in the Rhodes manual. There is a slight dip in the pedestal to take the shape of the rounded hammer cam I believe. I've seen a bump on the flat part of pedestal, and also pianos with them on the slope. Again it's difficult because so many pianos vary so greatly. I would try vintage vibe's method first on one key, then possibly try it on the slope. What you want to acheive is a hammer that rests on the bump when not depressed, and then when depressed the bump is out of the way, hammer flat on pedestal, and hammer tip not jammed up against the tine. I would use contact cement so that the bump and felt are removable when you're experimenting with this one key. Let me know what you see when the time comes! Here is a link to shed some light on the Miracle Mod for Rhodes pianos circa 76-77 with the pedestal felt on the hammers. I'm a little confused about the information given. I have a 77 Rhodes, with the felt on the hammers, and just got the miracle mod, haven't installed it yet. Should I just install the bumps on the pedestals and be done? Or should I install the bumps, remove the felts from the hammers, and install felts over my pedestals? And if I don't like it, I can just remove the bumps with Acetone? Does acetone thin cyanoacrylate (superglue)? Not sure, but the bumps will be pretty easy to remove if you don't like the feel. Or, you can use naptha to remove all traces of felt and adhesive from the hammer cam, and felt the pedistal with the bump in place. In my experience, leaving the felt on the cam and installing the mod has great results, alleviating any "slushy" feel. Removing the cam felt (and ALL traces of adhesive!) and felting the pedistal makes for a lighter, quicker action. So it's all in what you want out of your action... Just study bjammerz diagrams and watch Quadrapuss's video to be sure you don't interfere with the Rhodes' "stop-lock" position. No, I would not use acetone, it might melt the plastic bumps and make a mess- also you shouldnt use acetone too close to keytops,it definitely melts them. I would just scrape them off. I don't like using super glue to mount them,either. 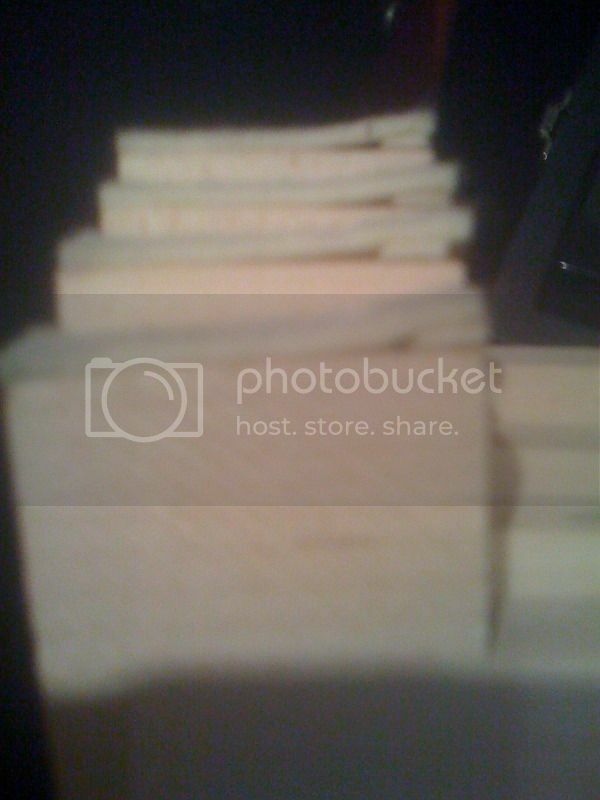 Super glue doesnt stick to wood very well. I guess it's pretty hard to biy the miracle mod kit in europe, and I guess it's quite easy to get hold of key felt material and something to act as the bump. Has anyone here any tips on what materials to buy and use??? You can use thin piano bushing felt,but placement of the bump is critical, and the felt method does not work as well as the actual bumps. See the picture(s) regarding bump placement. what are the bumps made of then? They can be supplemented with perhaps a thin zip-tie... plastic like material. The harder the better as felts etc will break down/thin over time. The bumps sold by Vintage Vibe are plastic. I never thought of the plastic tie tip that bjammerz suggests-great idea,Ben. Rhodes original service manual had a mod for making bumps completely out of felt...a felt bump covered by a piece of felt that covers the whole pedestal top. The plastic bumps are first glued on, then the felt is glued over them.Some models (such as the new models) have built in wooden bumps, covered in felt. I've had a couple people email me about installing the bump, and then the action feel "punchy," like it pops rather than smooth when hitting a key. The bump has to be placed far enough back that it doesn't allow the hammer to drag across it. If you install the bump too close to the end of the pedestal, the hammer when it rises will drag forward and prevent smooth movement. This is particularly more noticeable on the all-plastic hammer models because the hammer curve is sharper, like the first pictures at the top. This would create the "popping" feeling. I recommend installing one bump on one key first, and wait for glue to dry. Adjust the placement on this key until it feels right, or even install 3 bumps on 3 adjacent keys in slightly different places to feel the difference. Once you get the right placement where there's no dragging feeling or popping, and there's no double-bouncing etc, take your model key and replicate placement on all the rest of the keys. Am I correct in stating that "the resting position of the hammers after installing MM will be in a HIGHER position than without the MM bump added to the key pedestal" and that the hammers will now have less ditance to travel before hitting the tine. Great discussion , very helpful stuff. Yes. At rest, the hammer will sit higher. With the key depressed, the hammer should sit exactly where it did before (stop-lock position). The leading edge of the bump should be just contacting the hammer cam. Correct, this does limit travel, but the hammer now has a lot less friction on the up-stroke. You will be able to play with a lighter touch than before, and will have just as much bark (if not more) when you lay into it. I just did a big re-write to the main posting on the Miracle Mod for the interested parties, much more complete with photos and comparison for the felted hammer models. Fantastic rewrite- We are working on our service manual for the Vintage Vibe Piano- I would love to send it to you for editing ! I am trying to install the miracle mod on my hybrid hammer Stage 88. The question I have is how to know where to position the bumps before putting the felt on the pedestal. It seems that the felt adds a little thickness and thus functionally places the bump a bit further back on the pedestal. As I have currently set it up (on just the bottom octave so on a less important range), the hammer just rests on the felted bump when I have the key lightly depressed, but if I push the key down hard it lifts up just enough to get off the bump. Do I want the bump further back? It's not like this mod is easily reversible so I want to get it right on the first try. It seems that the felt adds a little thickness and thus functionally places the bump a bit further back on the pedestal. I've wondered about this myself but disregarded the issue when it came time to position the bumps. My understanding is that the only contact should be between the bump and the hammer cam until after the tine has been struck at which point the hammer should contact the entire face of the pedestal with the bump supporting the curve of the cam. Truth is, I haven't closely observed the action since installing bumps. I assume it's working properly because the difference in feel is profound. It's possible that my technique is flawed such that I tend to install the bumps a bit forward of where I intended thereby dealing with this issue automatically. The best advice for this is to try 3 keys in 3 different bump positions - using either a contact cement or other removable glue. 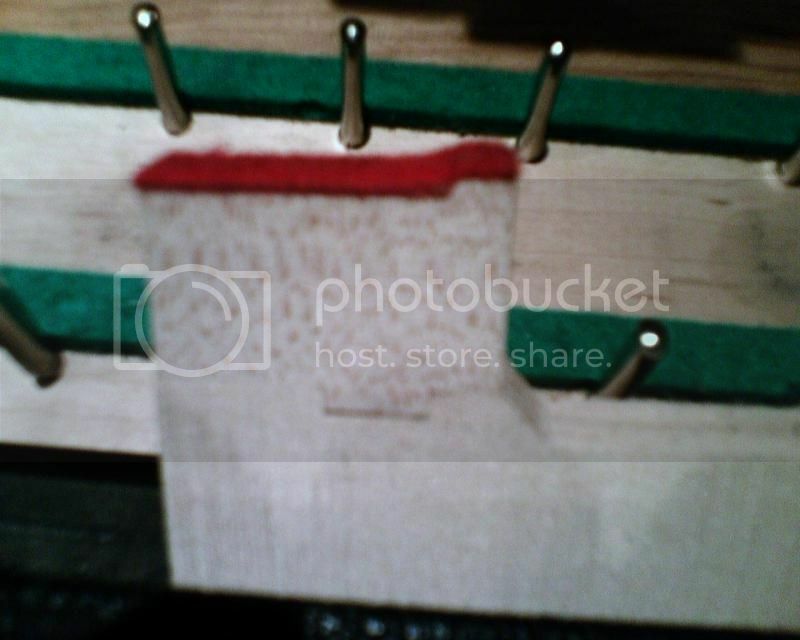 Even if you have the pedestal felts with the self-stick backing, if you remove them they should be able to be re-glued. Then when you have the best feeling position, you can replicate the best position of the bump all the way down the key bed. One thing to be mindful of though - check to see where your hammer rests on your lowest keys, and on your highest keys. If for example the hammer appears to be closer to the end of the pedestal on one side vs. another, your keybed / action rail might be slightly mis-aligned which means the ideal placement of the bump might change from top to bottom. It's not a significant change but you'll want to see if there's any variance before just slapping all the bumps on the keys right away. This made my day! A few months ago I was waiting on an order of my usual bump material and a customer wanted to get his pano back before a weekend gig. After digging around the shop for a while I found some zip ties that were just the right size to come through for the fast turnaround on the job. Plastic Tie wrap has been around for a long time, much better than using felt- Steve Hayes R.I.P use to sell them as his bump kit. If you get the right ones they are effective ,especially if you do not have a Miracle Mod handy . I have used them in the past. Still you have to cut them by hand and your left with a piano with cut pieces of tie clips, it's time consuming and they never cut evenly. 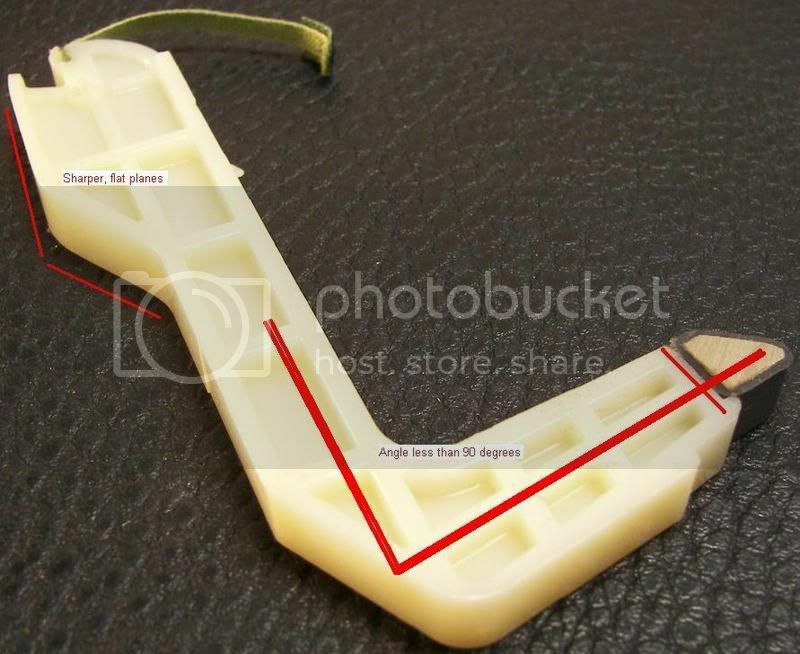 The Miracle mod plastic bump was made from a custom mold and they come all uniformly the same size with an accurate height. They are also a rounded surface that the cam rolls over easily into a brake position. We had them made red so they blend with the red pedestal felt for a professional looking and performing job our customers deserve. One day down the road when the next tech looks in there he'll say to himself one of two things, nice professional looking work or, look at this dubious job- I would want my name on that piano to stand for excellence cosmetically as well as mechanically.